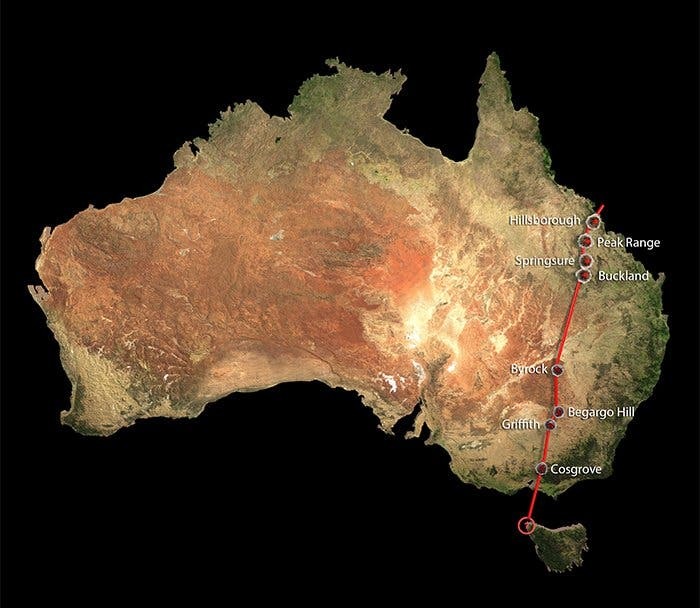 Scientists have discovered the longest chain of continental volcanoes in the world, stretching almost 2000 km (1200 miles) on Australia’s coast. The volcanic track includes 15 volcanoes formed over 30 million years ago. Volcanoes come in various shapes and sizes. There’s stratovolcanoes, cinder cones, shield volcanoes… and then there’s hotspots. In geology, a hotspot is a volcanic region in which the underlying mantle is considerably hotter than the surrounding mantle, and starts feeding a volcano; we’re talking about mantle plumes up to 3000 km (1800 miles) deep. Notable examples are Yellowstone and Hawaii. The thing is that the tectonic plates are not immobile – they move; granted, they move a few centimeters per year, but in millions of years, they can cross huge distances. However, the hotspot doesn’t move, it remains in the same place, and as the plates move above it, they create a trail of volcanoes. Such is the case with the newly discovered Cosgrove hotspot track. It consists of 15 ancient volcanoes that researchers already knew about, but didn’t know they were created by the same hotspot. It’s normal not to think the volcanoes are connected in any way – after all, they’re separated by more than 700 km (400 miles), but they all have the same chemical signature, with the southern volcanoes being younger than the northern ones. But the question arises, if the plate moved continuously, why is the distance between the volcanoes so big? Shouldn’t there be many other volcanoes, like with the other hotspots? Over millions of years, the Pacific Plate has moved over the Hawaii hotspot, creating a trail of underwater mountains that stretch across the Pacific. Image via Wikipedia. Well, researchers found that some areas of the Australian continent are too thick to let the heat of the mantle rise up and create a volcano. This might actually provide valuable information into how hotspots are formed and how the magma can breach through to the surface. Researchers have also projected where the hotspot is now, at the current rate of movement of the Australian plate, 7 cm per year. “There is some seismicity in this region, there’s been some earthquakes around that location recently which does hint that something is going on there, but we haven’t been able to find any seamounts or volcanic regions at present,” Davies told Stuart Gary over at the ABC.